Styled with jovano robe . Made from a luxe fabric with a beautiful drape, this fully-lined jumpsuit has all the charm of a dress — with all the convenience of a pant. Perfect for everything you have to go to this season. This jumpsuit is very classy and hangs nicely. I have it in black & denude. I am normally an xs but I bought it in xxs and it looks great! I have gotten compliments when I have worn it. It's dressy enough for a formal occasion or can be dressed down with nice flats. This is a sure win! I have tried a few different jumpsuits and this is the one that works for me. 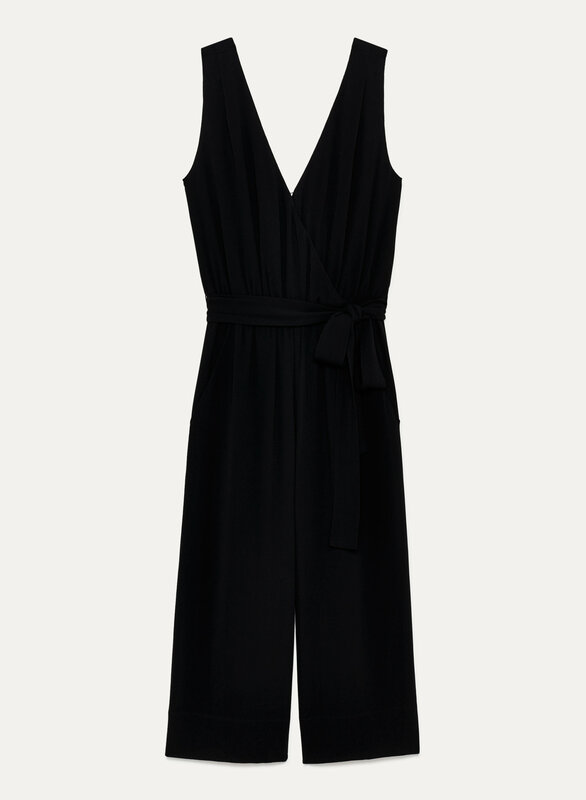 I found the Ecoulement jumpsuit is too short through the torso but I also have the melodie jumpsuit in a size small too and it is very nice as well. I am a TTS 4 or an XS or S. I bought this one in a small. For reference I am 5’6” tall. I like how it is relaxed but gives shape and the material hangs nicely and the pant portion is a perfect cropped length. I have it in black and denude. It is such a thoughtful feature to have the little snaps inside the shoulder to hold your bra strap in place. Love that! I can’t wait to wear it this spring.